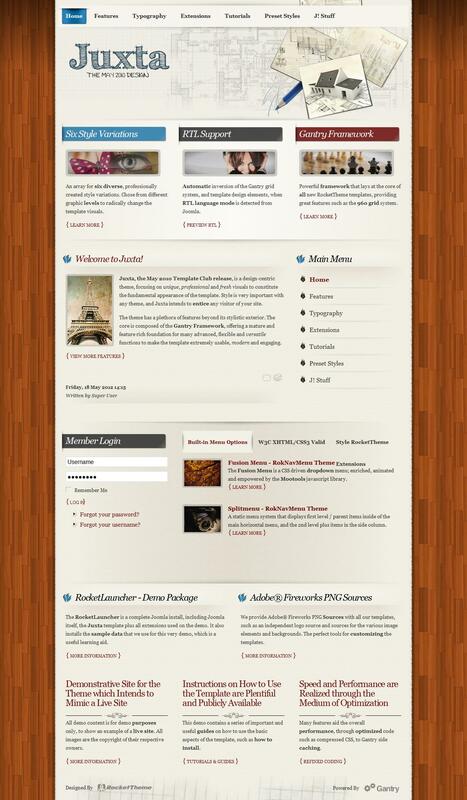 RT Juxta - gorgeous template from RocketTheme professional studio to create sites controlled by CMS Joomla 2.5. This template has a great design, based on an innovative graphic design. Template thematic range is practically unlimited. It is possible to create a website of any complexity and functional structure, ranging from a simple business card site, and ending with a functional portal. Proprietary platform Gantry Framework, provides an implementation of an incredible amount of versatile features that make the template as comfortable to use, modern and attractive. The template presented 6 preset designs, more than 60 module positions with 16 stylistic choices. The template contains the well-optimized code files, it supports a variety of mobile devices and all browsers.